KARAK: The reduced rainfall and increased temperature has been taking a heavy toll on wheat production in Karak district. Tribal News Network while talking to farmers and experts learnt that the district was extremely vulnerable to climate changes. Climate experts fear that if current rise in temperature several crops would disappear in southern districts of Khyber Pakhtunkhwa. Azmat Khattak, a local farmer whose family has been dependent on agriculture since decades, said he has been sowing pulses and wheat every year in his lands. He said since last eight to ten years, his crops production declined by 50 percent which is due to change in rain pattern and short winters. Farmers in Karak are completely dependent on rain water to irrigate their crops. Decline in rainfall since last several years have affected their crops productivity and even they miss wheat season due to unavailability of water. There is neither a canal nor a river in Karak district to provide water for irrigation of crops, yet agriculture is a source of livelihood of most of people and their farming is dependent on rains. According to data available with TNN, out of 75646 hactre land, 6000 hectre are irrigated through tube-wells while the remaining land rely on rainwater. Wheat is sown on 20,000 hecters of area followed by chickpeas that is Rabi crop and grown on 5000 hecter of land, officials at the district Agriculture Department. Besides, some farmers grow peanut, Kharif crop, however most of lands remain uncultivated for rest of the year in Karak. 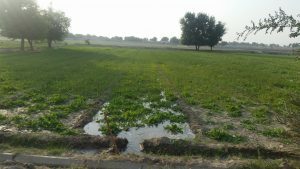 “Quantity, pattern and times of rainfall have changed since last 12 years that has directly impacted our crops,” said Director Agriculture Department Saeed Akhtar. He said that this change in rain pattern and increase in heat have badly affected wheat and chickpeas crops in southern district. “Wheat and chickpeas crops are sown on 90 percent of land, however, farmer miss sowing season due to late rainfall in October,” he said, adding that these crops are usually sown in October and need irrigation several times till January. He said that rain pattern has changed and a considerable decline has been witnessed due to which farmer receive low rainwater since September till March. Karak would produce 10,000 to 15000 matric tons of wheat every year that has been reduced by 50 percent as this year only 4022 matric ton of wheat could be produced . Farmer have sown wheat and chickpeas and waited for rains so that their crops could get water which they did not. “Development countries are responsible for excessive emission of greenhouse gases that has caused climate change and is affecting the under-developed countries,” Professor Jamal Khattak of Agriculture University Peshawar said. He said that poor countries are facing high floods, temperature, storms and drought because of such changes. He said that Pakistan was the seventh most vulnerable country in the world to climate change that has been affecting every sector. “Changes in rain pattern has caused decline in crops productivity especially in Karak where farmers see 70 to 80 percent reduction in their yield,” Professor Jamal added. The southern district receive maximum rains from April to August, he said, and advised farmers to grow such crops in this season. 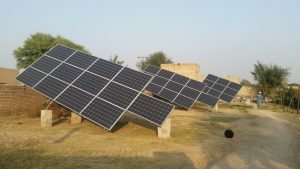 To cope with the prevailing environmental changes, farmers have installed solar tube-wells due to which their crops get enough water that doubled their harvest. However, Professor Jamal said excessive pumping of ground water would have devastating effects on coming generation. He suggested construction of dams on flood streams if the government was serious in resolving issue of water shortage in southern districts. TNN learnt that Soil Conservation Department has constructed seven small dams, of which two are for irrigation purpose. Director of the department Yaseen Wazir said that there are 100 such points where small dams could be constructed in Karak that would not only resolve irrigation water shortage but would provide enough water for drinking. By 2035, average temperature of K-P would rise by one more degree Celsius that would lead to disappearance of certain crops and introduction of new crops, claimed Dr Muhammad Akmal, chairman Agronomy Department, Agriculture University Peshawar while talking to Tribal News Network (TNN). The only way out is to grow more and more trees, controlled urbanization and mass awareness, he added. The provincial government has launched Billion Tree Tsunami project to plant as many as one billion tree and have been taking measures to achieve this target. Project Director of Billion Tree Tsunami Tehmasip tolled TNN they have banned grazing, cutting and every kind of activities on 200,000 acres of forest lands to ensure natural growth of plants. Dr Akmal, who also served as director Climate Change Unit of his university, warns that by 2030, winter rains would shift to summer if steps were not taken to contain rise in temperature. “This would lead to dry and hot winter, while summer would turn wet and relatively cool,” he said.